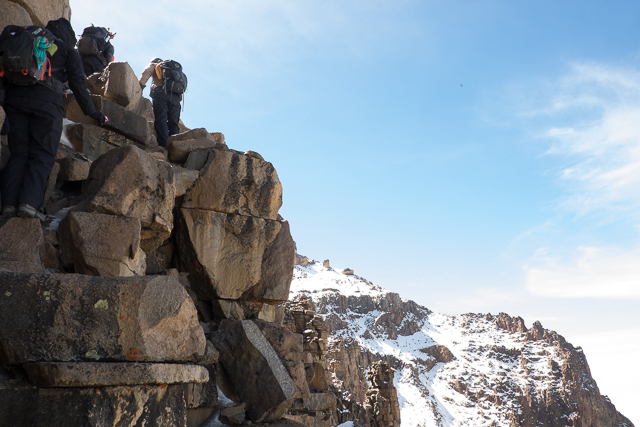 We reached a ledge where we could rest and have a picnic ⅚s of the way up the formidable 3,000 ft high (over 1,000m) Western Breach. 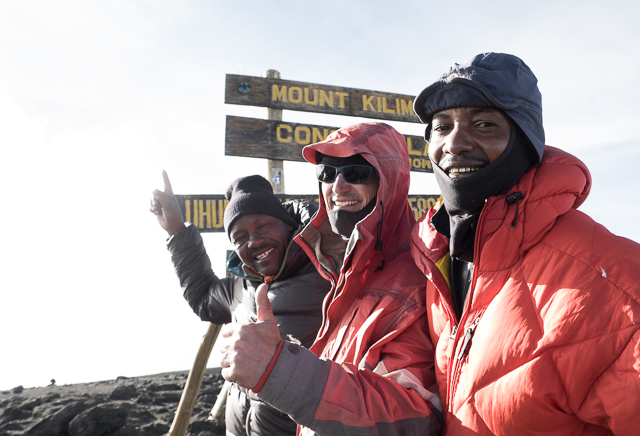 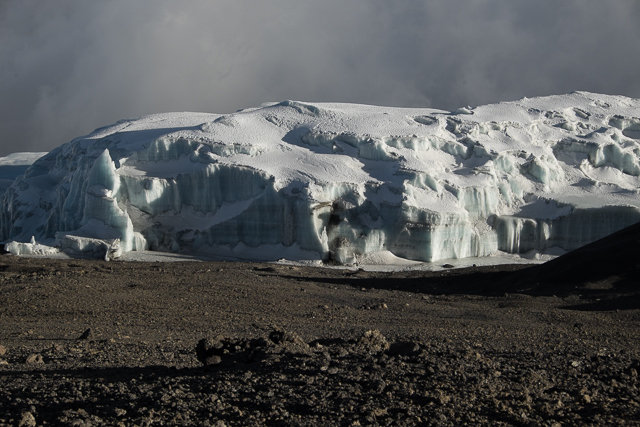 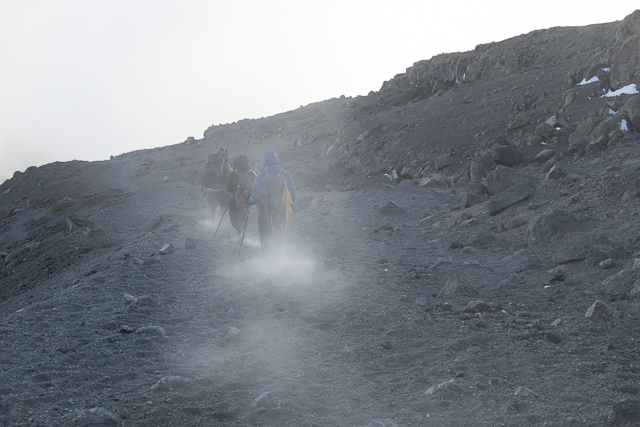 The Breach is the steepest and hardest non-technical route up Mount Kilimanjaro. 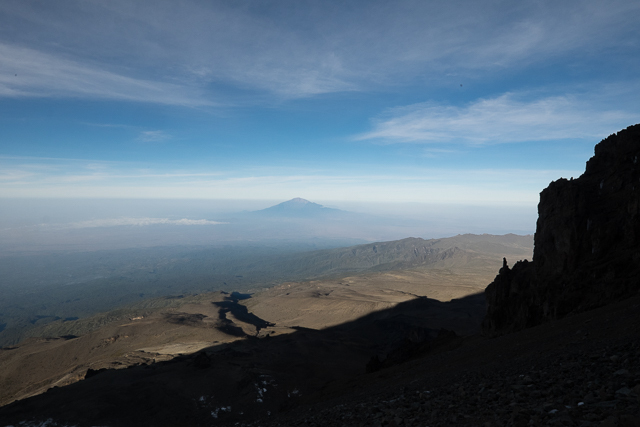 Even though it is hard to breathe (there is nearly half the available oxygen here as there is at sea level), the vistas make the effort worth while. 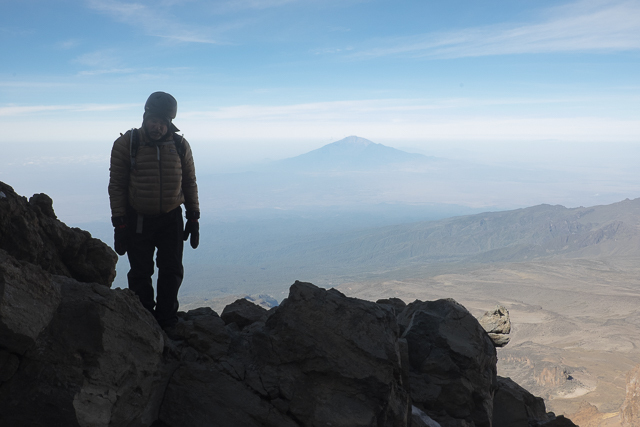 It feels like we are on a ledge with the world spread out below us. 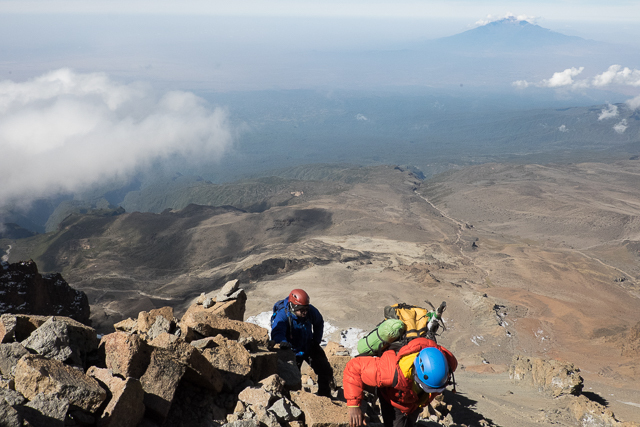 Being quite exposed, we enjoy astounding views of 15,000ft (4,565m) high Mount Meru 40 miles (70 kms) to our west, and of the volcanic plug called Lava Tower, about 2 miles (3.2 kms) to the north-west and 2,500ft (760m) below us. 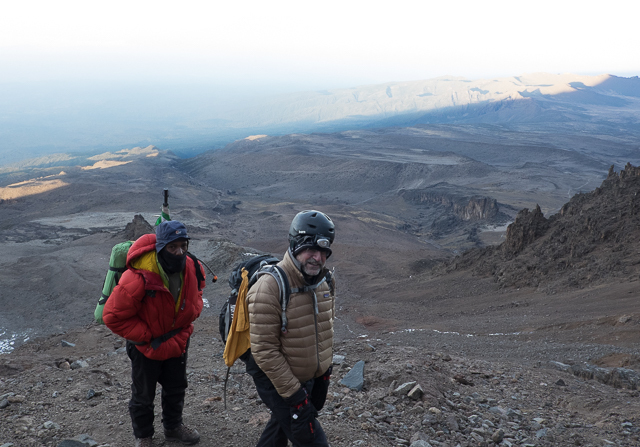 After a light brunch and a drink we continue the climb to the rim and walk across the crater, past isolated chunks of Furtwangler glacier, arriving in camp 9½ hours after setting out at 4am last night. 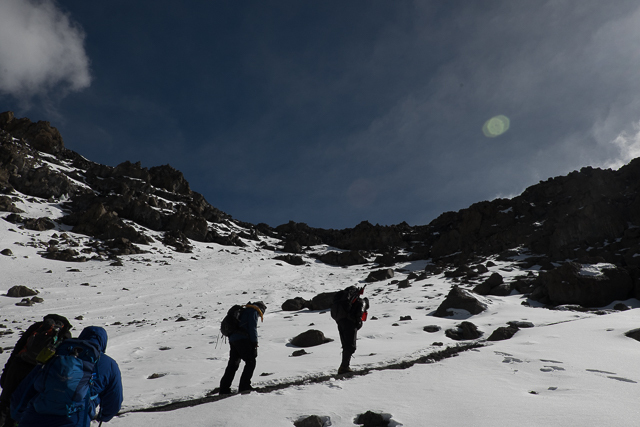 While our climb had been steady, this was a relatively slow pace. 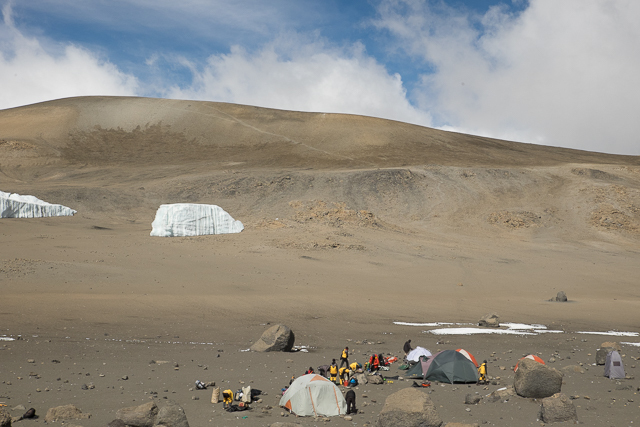 The itinerary involved sleeping the night here. 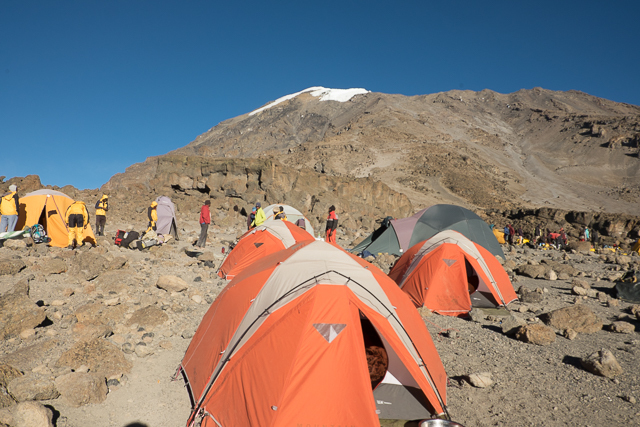 The camp was now 1,200 ft (365m) higher than base camp Everest, and I decided that because of our pace, it would be wiser to continue to the summit and descend to a lower altitude for the night. 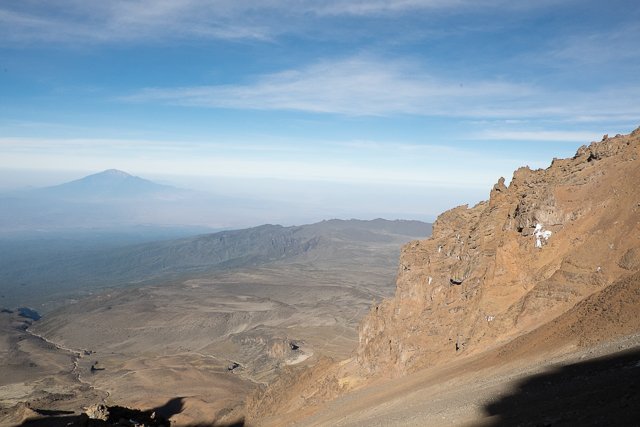 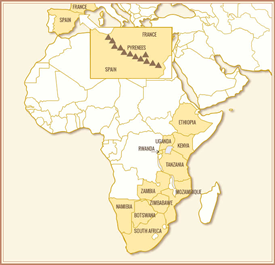 Sleeping lower and on a descent route rather than in a crater reduces the risk of health complications affected by high altitude. 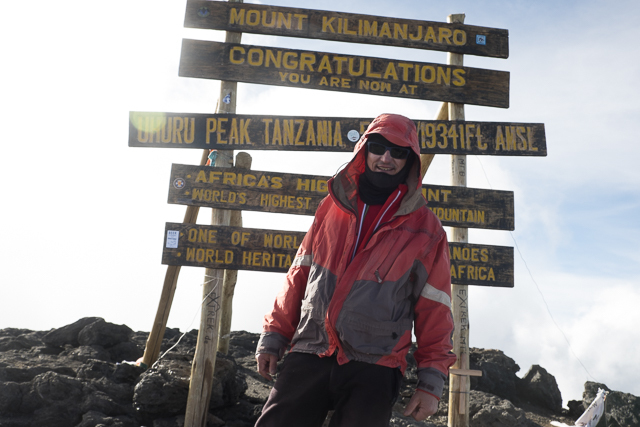 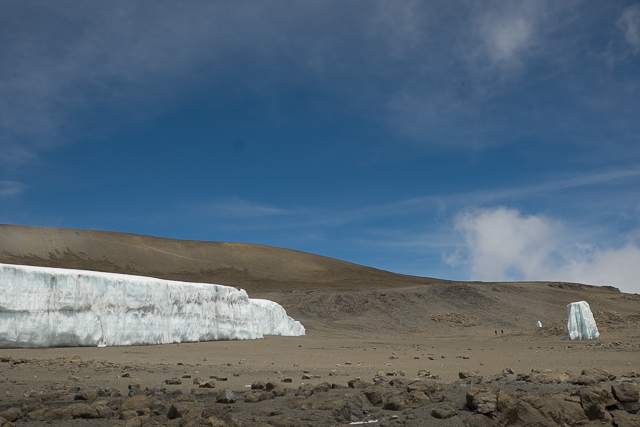 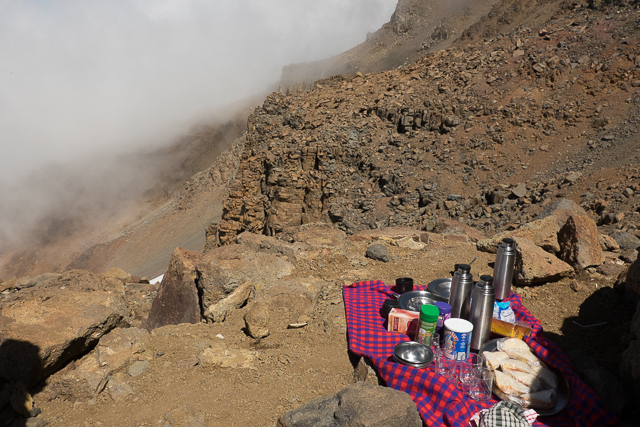 So we had tea, and two hours later continued our climb up a snow and ice-covered scree to the southern rim of Kibo Crater. 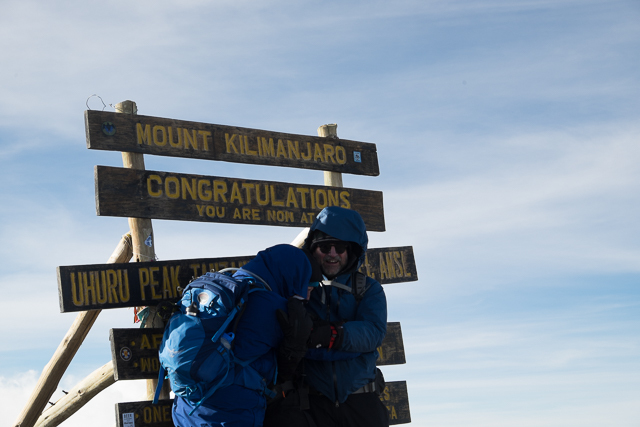 We arrived on the top of Africa about 2 hours after leaving camp, just after 5pm. 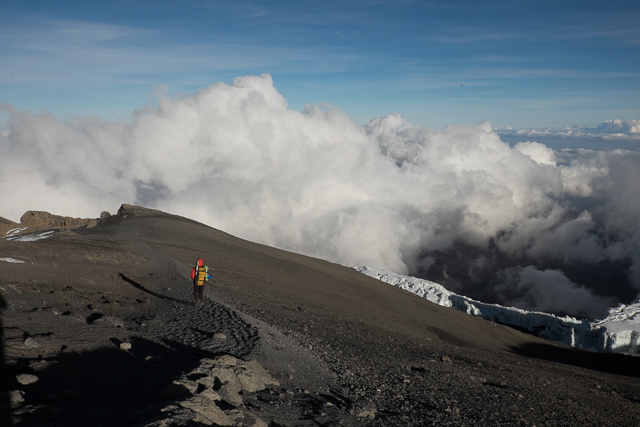 The wind had slowed to a frosty breeze, and the mist that had come and gone during the climb sank and joined the puffy cumulus clouds below, leaving us and the summit zone floating above it all. 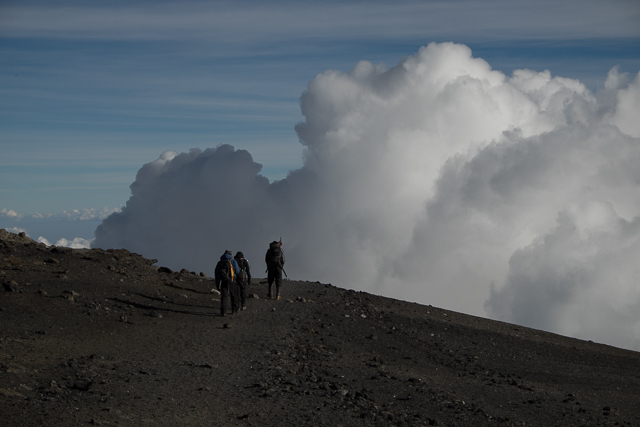 We were alone up there, the only sounds being the wind and our voices. 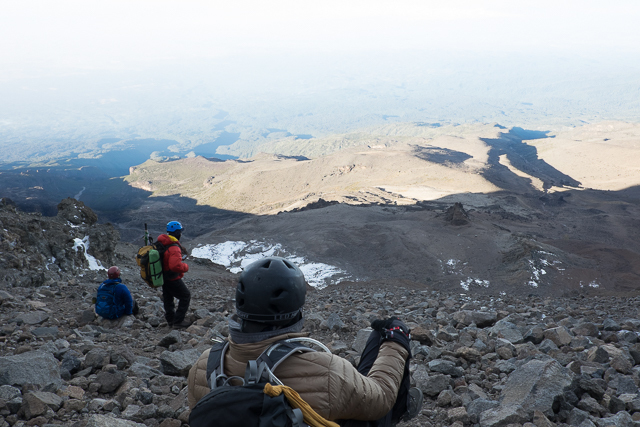 We had time to enjoy the views and test all our cameras and smart-phone’s picture-taking abilities, which thankfully worked. 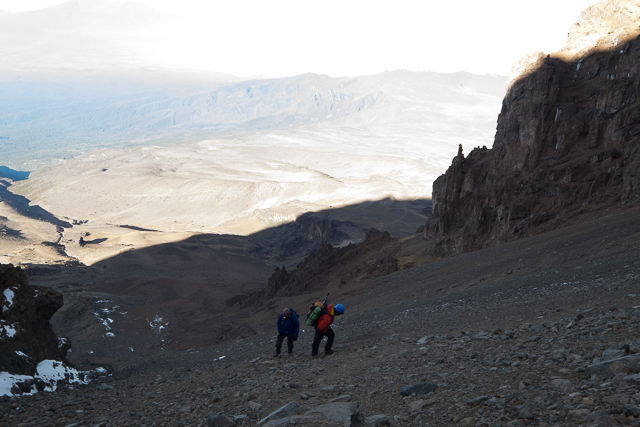 As we began the descent in a daze of achievement the colours and light changed by the minute, illuminating the rusty and black volcanic rocks, the ice and the puffy white clouds below, sometimes glaringly light and whitewashing everything, and then rapidly changing through a light-show of fire-red oranges, deep azure blues, and varying shades of greys. 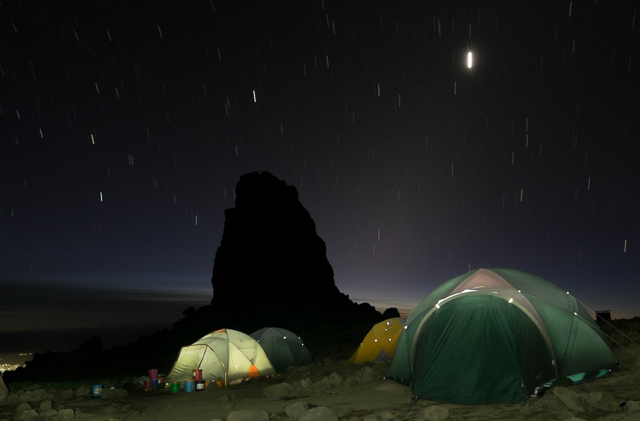 We reached the rim at Stella Point 18,860 ft (5,750m) and began the two-hour 3,000ft slip and slide down the scree face, and into the blackness to camp, having hiked for about 16-17 hours including breaks – tired and elated.